Tumblr is worth far more to Yahoo than $1.1 billion, and worth far less as a standalone company. That makes this acquisition a win-win; Yahoo is buying three important parts of the signal-to-ads cycle, and Tumblr’s investors are getting a nice exit. Tumblr helps Yahoo on all three fronts, particularly the third, where the signal-to-ads cycle really matters. The most obvious way to grow revenue is to increase impressions, and fill those impressions with ads. Tumblr’s nascent radar advertising already has 120 million daily impressions, but they are having trouble filling it, and they haven’t even touched display advertising. Yahoo brings one of the largest ad sales teams in the industry to the table, along with the ability to offer advertisers a full spread of campaign options that reach every demographic. It’s a great complement. Still, though, increasing the number of ad slots is ultimately deflationary; it doesn’t do much good to sell 20 ads at $1 each instead of 10 ads at $2 each. To this point, there have been two types of online advertising: display and search. 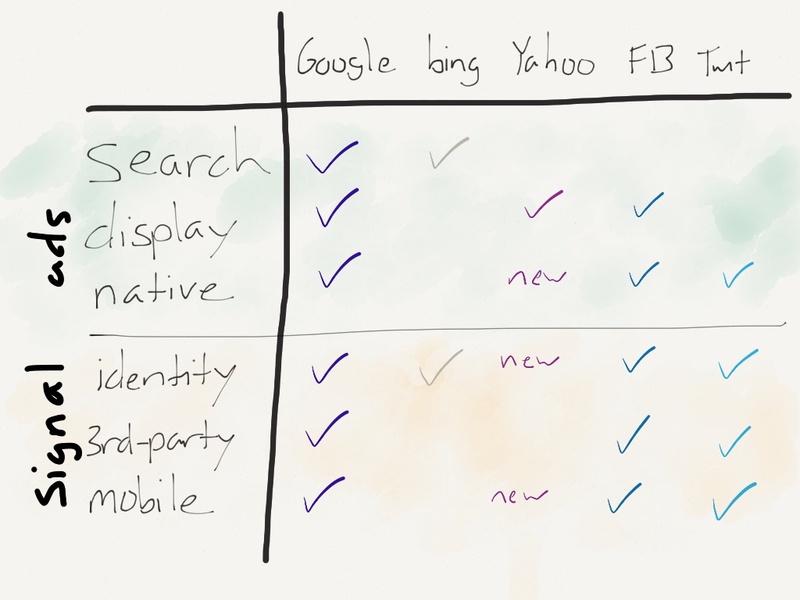 Display is what Yahoo is built on, and it’s fine as far as it goes. Actually, it’s not that fine at all: It’s not very relevant, it drives bad behavior, and, as I just noted, it’s deflationary. Search ads, on the hand, are much more effective. The best search ads are super relevant, and that relevance drives the price up, not down. Unfortunately for Yahoo, they gave this business to Microsoft. However, there is a third form of advertising that is emerging on Twitter, Facebook, and new-generation sites like Buzzfeed: native. Native advertising intermingles advertising and content; the advertising is less obtrusive, and, done well, is just as interesting and readable as everything else in your stream. When you consider what has worked on other mediums – voiceover for radio, commercials for TV, spreads for magazines – there’s reason to believe this is the future of online advertising. Tumblr is focused on native advertising, and Yahoo now has a toehold. The best paying ads are those that directly hit a brand’s demographics and/or are clicked on, and ads are clicked on when they are personal to you. And so, online advertisers need great signals about who you are, where you are, and what you like. This information has traditionally been captured by tracking you across the web; think AdSense, or those Facebook ‘Like’ buttons. But mobile has opened a new treasure trove of information, even as it raises new challenges: specifically, sandboxed apps mean the old methods of cookie tracking don’t work. 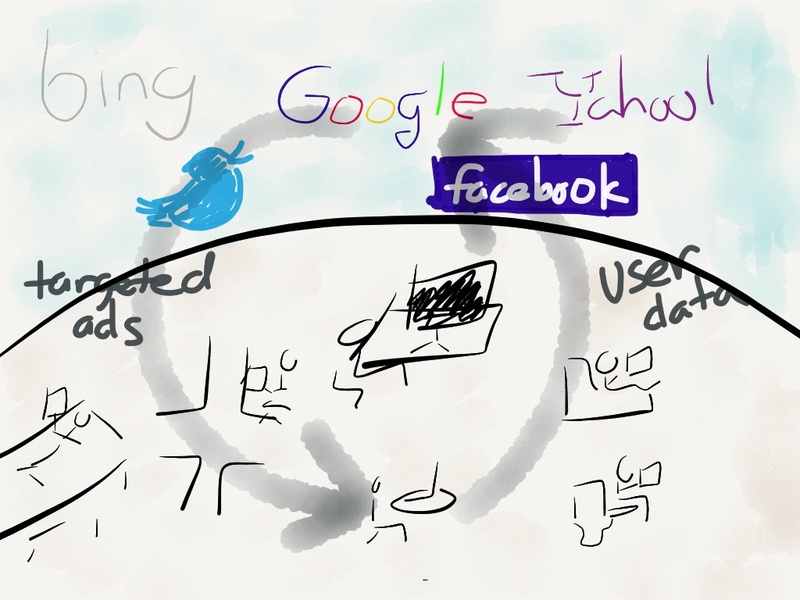 The solution to no cookies is identity; as I wrote last week, this is what Google+ is all about. Google builds best-in-class mobile apps that work significantly better when you log in with the Google+ account you didn’t even know you had. Google is pretty far ahead in this game. They provide best-in-class mobile apps, track you across the web, and then monetize you on their search engine, YouTube, Gmail and AdSense. Everything is connected; it’s either signal or ads. Tumblr helps Yahoo catch up. Every Tumblr user has registered with an email address; that email address will be the linchpin for Yahoo’s targeting, especially since they gave up on their own identity system a few years back (YAMM – Yet Another Massive Mistake). Tumblr is also a great indicator of interests – you follow certain tumbleblogs for a reason, and the fact every blog will be hosted by Yahoo gives them full access to user analytics. More importantly, Tumblr is mobile, and mobile is an information goldmine (interestingly, the Tumblr app does not currently use location services; look for a new “feature” update soon). While I think this is a good move, and affirms that Yahoo is an advertising company, they are by no means out of the woods. The fact they don’t control their own search or identity services is absolutely killer, and speaks to how incompetent Yahoo’s past leadership was. In fact, only Google has a full set, which suggests that Tumblr may not be the last acquisition in this space; any missing piece in the signal-to-ads cycle dramatically decreases its effectiveness. It’s certainly worth pondering who might be buying, and who might give in to an offer too good to refuse.